The VM-44 is a FET condenser microphone system designed for very fast transient response and a clean and neutral sonic profile. Three detachable, interchangeable capsules are currently available: Cardioid, Supercardioid, and Omnidirectional. All three capsules use 16mm (round) capsules, handmade in-house by Milab staff. The diaphragm material is thin Mylar, metallized with vaporized Aluminum. The transformerless amplifier circuit was designed for “maximum transparency.” The result allows the sound of the capsule to be captured at maximum fidelity. Mics are matched within 2 dB (+/- 1 dB) from 200Hz-10kHz and within 1 dB (+/- 0.5 dB) for sensitvity. 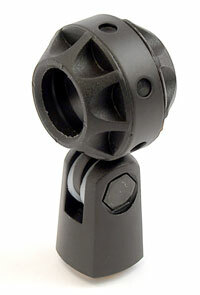 Milab provides single microphones, as well as two levels of matching. For normal stereo usage, “stereo pairs” are matched to ±1dB (2dB total range) from 200Hz–10kHz, with no more than 1dB (±0.5dB) difference in sensitivity. For the most critical stereo applications, Milab creates “matched pairs:” bench-tested to be within ±0.5dB (1dB total) in sensitivity and frequency response over the entire audible range. Both types of pairs are shipped in a padded SKB case, and include the mics’ individual frequency-response charts. Single VM-44 mics with a Cardioid capsule, a foam windscreen, and a rubber isolation clip. The Omni and Supercardioid capsules are sold separately, as are additional accessories (including a foam-lined mahogany storage case). The Milab Microphones VM-44 is also known as: VM-44 Classic. The mic was released in 1988.